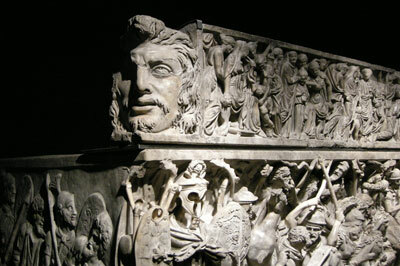 Currently on display in a darkened room at the National Museum of Rome, spotlights - to show off the incredibly detailed carvings upon the box-like funeral receptacle - light the Portonaccio sarcophagus. Sarcophagi were commonly carved in stone and made in either Rome or sometimes Athens, this particular one dating from 190 and 200AD. The piece was discovered in 1931 near Via Tiburtina, in the eastern suburbs of Rome, but who is buried inside is unknown. 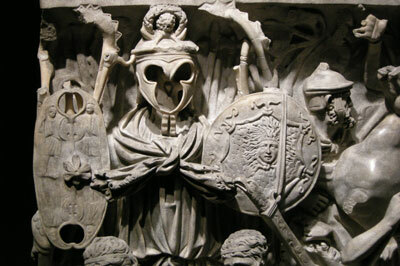 This sarcoghagus is said to be one of 25 late Roman battle sarcophagi, which would have taken over a year to make and was incredibly expensive. 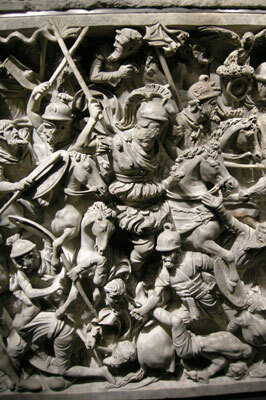 The sarcophagus was thought to have been for the burial of a Roman general, who was involved in the campaigns of Marcus Aurelias. 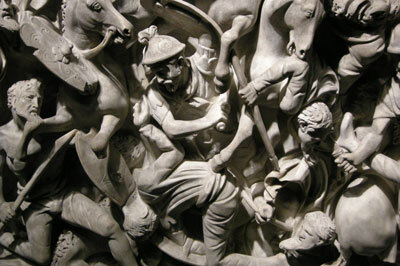 This is also thought due to the similarities between the techniques and influences used on the sarcophagus and those on the Column of Marcus Aurelias. 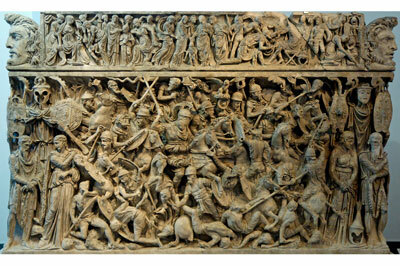 There is a standout figure in the carving - a figure of a man, in the very centre of the work. It is thought this is supposed to be the general buried inside, but the face of the figure was left unfinished. There are two possible reasons for this: the first may have been down to the sculptors waiting for a model to work from, or they had produced the sarcophagus speculatively, with no specific commission to work for. Either way, an air of mystery surrounds the Portonaccio sarcophagus, only making the detailed carvings more beautiful and intriguing.